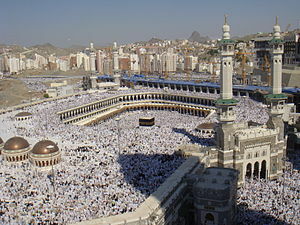 The annual Hajj pilgrimage to Mecca, Saudi Arabia is amongst the largest mass gatherings in the world. It draws about 3 million Muslims from around the world. Each year, more than a thousand Muslims from Singapore make the pilgrimage. Umrah is a similar pilgrimage that many Muslims take during the month of Ramadan. Here are some tips to help keep you safe and healthy during your pilgrimage. Before your trip, ensure that your vaccines are up-to-date. The Meningitis Vaccine is mandatory if you are travelling to Saudi Arabia to take part in the pilgrimage. Malaria prevention tablets is recommended for Al Bahah, Al Madinah, Asir (excluding areas above 2000m altitude), Jizan, Makkah, Najran and Tabuk province. There is no Malaria risk in urban areas of Jeddah, Mecca, Medina and Ta’if. It is always useful to pack a travel health kit with essential medicines for common colds, diarrhea and minor cuts and bruises. Beware of what you eat and drink. Avoid street food vendors if you can. Avoid having ice in your drinks if you can. The ice may be made from contaminated water. Where possible drink only boiled or bottled water. The climate in Saudi Arabia can be very hot and dehydration is a possibility. Always drink lots of water and remain hydrated. Only go to official designated centres for head shaving. Ensure a new blade is used for your head shave. Avoid swimming in fresh water lakes and rivers. Schistosomiasis is rare in Saudi Arabia but still present. After your trip, if you feel unwell in anyway, make sure you see your doctor and let him know of your recent travel. The MERS outbreak is still ongoing in the Arabian Peninsula. It is a viral diseases that can spread from person to person. Want to know more about the travel health and travel vaccination services, please come down to Our Clinics or call Our Doctors. I really loved reading your post. It is a very informative post for me and everyone who want sot tour. Thanks for sharing this information with us. This is very nice to have such a useful information about how to take care of Hajj and Umrah ..